She has enchanted you from the beginning. 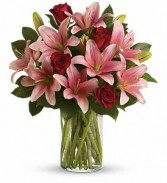 Send this lovely arrangement of lilies and roses to let her know how you feel. 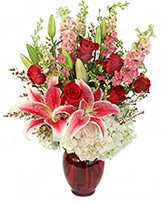 Four red long stem roses are a beautiful accent yet make a statement in the piece. 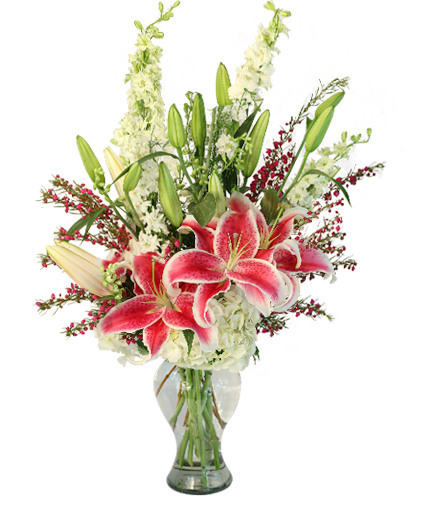 Picture used with permission by Teleflora. She's always a Lady and the perfect one for you. 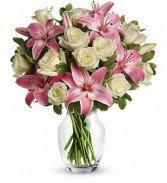 A dozen beautiful white roses arranged with pink lilies makes an exquisite combination. Arranged in a clear glass vase. Substitutions made when necessary. Picture used with permission by Teleflora.